The San Francisco Giants finished last season with one of the worst offenses in baseball and didn’t make a significant offensive upgrade during the offseason. While there were several moves available to them in the offseason, one option that is often cited by the local media revolves around Adam Dunn. 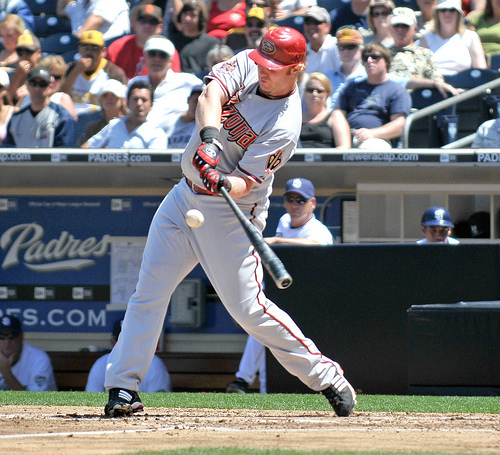 Dunn, an outfielder who finished last season with the Arizona Diamondbacks after spending the previous 7+ years with my beloved Cincinnati Reds (I grew up in nearby Dayton, Ohio), is a feast or famine slugger who could have given the Giants an offensive presence that they lacked. Dunn was ultimately signed for a 2 year $20 million contract by the Washington Nationals, fairly inexpensive in today’s baseball marketplace. Now, fast forward to July of the 2009 season and the Giants are surprisingly in the thick of the Wild Card race. Their weakness is still offense and the rumors are that they are considering acquiring Dunn at the trade deadline (although this is less likely given today’s news that they have acquired second baseman Freddy Sanchez). This leads to an obvious question: why didn’t the Giants sign Dunn in the offseason as a free agent (and not have to trade any of their existing players to get him) instead of potentially trading for him during the season when they’d have to give up players or prospects to acquire him? The Oakland A’s are run by general manager Billy Beane, who gained fame through the profiling of his strategies in the book Moneyball. Working for the low-budget A’s, Beane is constantly trading established players before their contract demands get too high for young, prospects. Surprisingly, Beane acquired All-Star Matt Holliday from the Colorado Rockies during the off-season, offering well regarded prospects and an established closer. It was an interesting move as it appeared the A’s were a few more moves from contending, particularly in their starting rotation. Sure enough, as of today, the A’s are nowhere near the top of their division and traded Holliday this week to the St. Louis Cardinals for 3 top prospects. An obvious question that comes up is why would Beane trade for Holliday and give up top prospects just to trade him after a half season? Option to Defer: Invest smaller amount today to have the right to defer an investment decision in the future. Example would be hold a lease on land to determine whether to construct a building in the future. Interacting Multiple Options: Multiple options from the five above that are interrelated—many real options provide a combination of the flexibility created from the above. The Giants passed on signing Adam Dunn or any prominent offensive free agent in the offseason and thus avoided making a large investment, but made small moves, and a small investment, by signing average shortstop Edgar Renteria and veteran pitchers Randy Johnson, Jeremy Affeldt, and Bob Howry. However, now two days before the trading deadline, and currently tied for the wild card lead, they’ve made two trades, trading for Ryan Garko, a slight upgrade to their existing 1st base solution and for Freddy Sanchez, a former league batting champion and All-star, and they may not be done yet. What I believe they’ve done is follow an Option to Defer. I honestly don’t think that GM Brian Sabean thought they had a team that would compete in 2009 even with a player like Adam Dunn, so they decided to forego the large investment in the offseason but made a small investment in Johnson, Affeldt, and Howry that they hoped would give them a chance to compete, and then if market information at the mid-season point in 2009 suggested they were in a pennant race, they could make a trade and risk losing solid prospects (pitcher Tim Alderson) and make a more expensive investment in a player like Adam Dunn or a Freddy Sanchez (who desires a $20M contract over the next 3 years). Low and behold, the Giants are in the Wild Card race, thus the market information became more clear and they could invest more (Sanchez’s salary demands and losing prospect Alderson) which would pay off in the form of greater ticket sales and enterprise value if the Giants made the playoffs which they hope the arrival of Sanchez ensures. The A’s traded 3 players for Matt Holliday in the off-season only to trade Holliday near the trading deadline for three additional players. Beane’s strategy seems to me to be an Option to Alter. Beane traded for Holliday and thus made the investment (investment was primarily through losing the three players: Huston Street, Carlos Gonzalez, and Greg Smith) to scale his operations from the beginning of the season by improving a weak offense. If the team’s record (market information) didn’t suggest a chance at the playoffs, he could then use that information at the trade deadline and contract his future investment level by trading Holliday for other young prospects. And with Beane’s confidence in getting the best prospects, he felt he could get three better prospects than the three he gave up. Time will ultimately tell, but he acquired Brett Wallace, Clayton Mortenson, and Shane Peterson from the St. Louis Cardinals, with Wallace considered the gem of the trio. Many analysts such as Ken Rosenthal are already claiming that this trio are better prospects than the original three Beane traded to get Holliday. (Note: Beane’s halo is starting to diminish given the A’s struggles the last couple of years as evidenced by this critical article). In my professional career in corporate finance, I’ve used Real Options theory primarily in evaluating capacity and resource investment decisions, but to me, it definitely helps provide a framework for some of the investment decisions and timing of those investments that baseball GM’s are making. I like your explanation of Real Options Theory to us non finance guys–it makes sense in the case of these two teams. Apurva, great insights. You’re right, looked at in this light, these decisions on the part of the GMs do look a bit more like a utilization of Real Options. This is a really good framework for evaluating some of the personnel decisions that people are making. I prefer it to the columnists back and forth about “that’s a dumb move” and “he should have done that a long time ago” when they report on decisions. Especially in baseball, where the season is long enough to make adjustments mid-year, depending on your team’s performance, this style of thinking is really powerful. Great post! Slamdunk– thanks for the feedback. I actually believe there are a lot of financial, economic, and strategic business frameworks that can easily be applied to sports. This is one example. Glad you liked it. Robi– yes, agree, that its very easy for columnists and fans to simply say “what are they doing”, “stupid move”, etc. but if you peel back the layers, there’s some strategy there. Now, may not always agree with the strategy, but I think it’s important to try to understand the strategy before concluding how stupid there move is.